Our Annual Report charts a year of change both within our organisation and the sector. 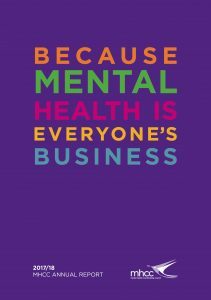 MHCC has supported a strong community-managed mental health sector with policy leadership, research, training and resources. The report shows the progression of our recognised expertise in peer workforce development, recovery-oriented practice, trauma-informed care and the NDIS, all of which are highly valued by the sector, government and policy makers alike. The year’s work has underpinned our vision that people experiencing mental health conditions are supported to live meaningful lives in the communities of their choice.